Chandra images of multimillion degree Celsius gas in galaxy clusters have provided astronomers with a powerful new method to probe the mass and energy content of the universe.A recent study of 26 clusters of galaxies confirms that the expansion of the universe stopped slowing down about 6 billion years ago, and began to accelerate. The clusters were carefully chosen for their dynamically relaxed state and because they span a large range of distances, from one billion to eight billion light years from Earth. These Chandra images show 3 of the clusters used in the study - from left to right Abell 2029, MS 2137.3-2353, and MS 1137.5+6624, seen as they looked 1 billion, 3.5 billion, and 6.7 billion years ago, respectively. A galaxy cluster is comprised on hundreds of galaxies embedded in a cloud of extremely hot gas and dark matter. Dark matter, an invisible and unknown type of material, is postulated to hold clusters together. X-ray observations have the unique ability to determine the ratio of the mass of the hot gas and the mass of the dark matter in a cluster. The observed values of the gas fraction depend on the assumed distance to the cluster. Because galaxy clusters are the largest bound structures in the Universe, they are thought to represent a fair sample of the matter content in the universe. If so, the ratio of hot gas and dark matter should be the same for every cluster. Using this assumption, the distance scale can be adjusted to determine which one fits the data best. These distances show that the expansion of the Universe was first decelerating and then began to accelerate about six billion years ago. Many scientists attribute the driving force behind cosmic acceleration to dark energy a strange form of energy that acts like repulsive gravity. It could be due to extra dimensions of space, or possibly it is an indication that modifications of Einstein's theory are needed. 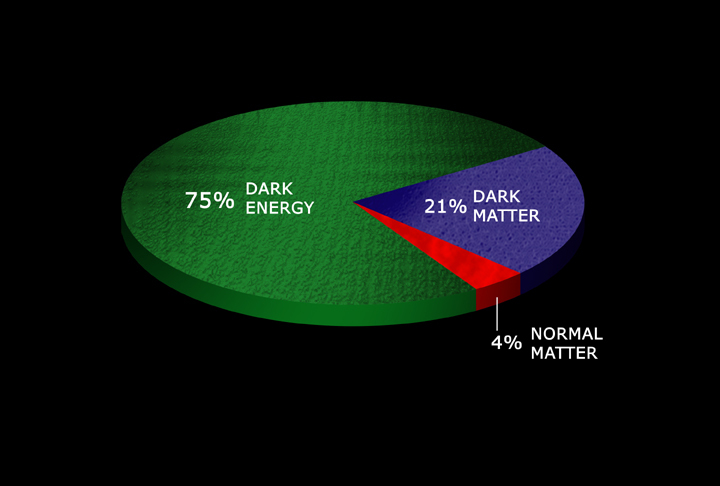 Assuming that dark energy is responsible for the acceleration, combining the Chandra results with observations of the cosmic microwave background radiation indicates that dark energy makes up about 75% of the Universe, dark matter about 21%, and visible matter about 4%. The Chandra observations agree with results from the Hubble Space Telescope (HST) and other optical telescopes, which first showed evidence for an accelerating expansion of the Universe. Chandra's independent verification helps to strengthen the case for cosmic acceleration. The new Chandra results suggest that the dark energy density may be constant. If so, the Universe would continue expanding forever, with galaxy groups and clusters spreading further and further apart. The Chandra data also allow for the possibility that the dark energy may be increasing slowly with time. In this case, the cosmic acceleration would increase until, at a far distant time, galaxies, stars, planets and even atoms will eventually be torn apart in what has been termed The Big Rip. Coordinates (J2000) RA 15h 10m 56.10s | Dec +05° 44' 38.00"
Coordinates (J2000) RA 21h 40m 12s | Dec -23° 39' 27"
Coordinates (J2000) RA 11h 40m 23s | Dec +66° 08' 42"